As we get ready to move into another set of Tears for Fears shows in the coming cooler months, we’re reflecting on the excitement that took place a little more than a month ago. Big thanks to our dear pal Pennie for sharing her experience! Living in a destination city, I have been fortunate to have seen Tears for Fears locally. In the last year I’ve had the opportunity to travel to a couple of shows out of state. 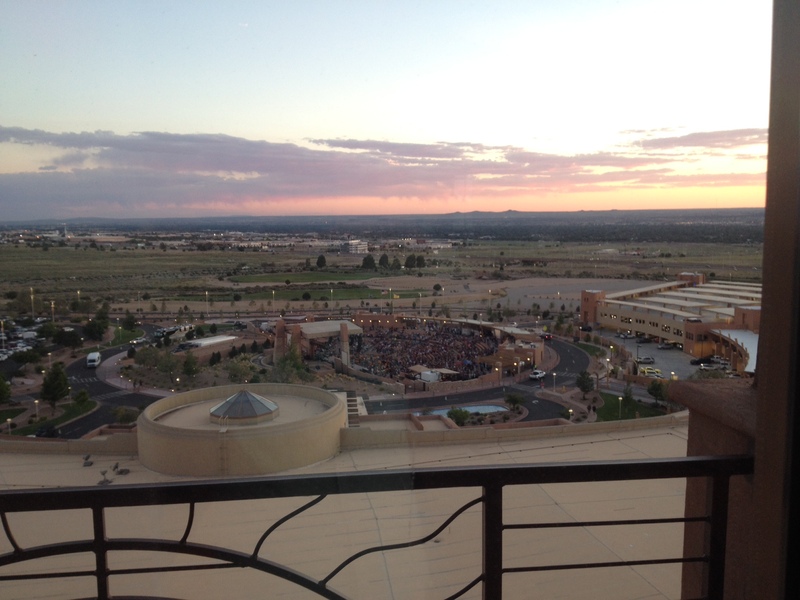 I decided on Albuquerque/Sandia Resort because the show was at an amphitheater which had wonderful reviews, and this would be my first show experience at an amphitheater. I arrived mid-morning. The grounds of this resort are quite remarkable, with a beautiful golf course that seemed to be more enhanced by the stunning Sandia Mountains in the distance. In the lobby of the hotel I was greeted by a large TV screen displaying the announcement of the TFF show! I was obviously in the right place! -The wonderful guitar rift on EWTRW makes me feel like I’m floating. -I LOVE the new techno intro for Pale Shelter. -Break it Down Again (video below)- Roland was doing his best to keep the crowd involved, encouraging everyone to get their arm up and swing it side to side. We had a pretty responsive audience. -Memories Fade- This song is quite emotional for me. I never get tired hearing TFF play this song. -Creep… we all know how we feel about Creep!! I took an audio recording of Head Over Heels. I always do when my daughter isn’t with me. It’s one of her favorite TFF songs and I love to share the moment with her. Later in the show, the wind picked up quite a bit and was blowing from all different directions. The band had a heck of a time keeping their hair from blowing across their faces… some more so than others. Roland stated joking with Curt about his hair which made the crowd laugh. During the show I noticed a guy running up and down the steps several times who would turn his ear to the stage and listen as he reached a seat below us. I ran into him after the show and asked if he was working the boards because I kept seeing him running up and back? He said “Yes, how did it sound?” You could tell he was genuinely interested in my opinion. I told him it was absolutely wonderful. I come away from this show knowing that Tears for Fears genuinely cares about their fans. We are truly fortunate to have Tears for Fears touring again! TFF Travel Fan Pennie K.
Posted on 27/07/2015 12/08/2015 by International Business and Cultural ExchangePosted in Meet The Fans, Tears For Fears Live Shows, Welcome to the Tears for Fears Fan Travel BlogTagged band travel, Classic Rock, Concerts, Tears for Fear Fears, Tears for Fears 2015, Tears For Fears Concerts, Tears for Fears Fan Club, Tears For Fears Fan Fun, Tears For Fears Fans.